Just outside Acapulco, Mexico, inside the Veladero National Park, the Palma Sola Archaeological Site is being run by the Mexican National Anthropology and History Institute. This magnificent site is not just incredible because of the 18 stones that contain numerous carvings, but you will also get one of the most beautiful views of Acapulco Bay. Sitting high above the bay at over a thousand feet, you will see incredible designs of anthromorphological and zoomorphological carvings that were put here by the first settlers in the region, the Yopes. Not much is available as far as information goes about this tribe or its wonderful culture, other than what archaeologists have gleamed from the digs and stones that relate some of their story and culture. It has been dated to around 600 B.C. to 200 A. D., but other than that, the story of the Yopes is still a mystery waiting to be discovered. 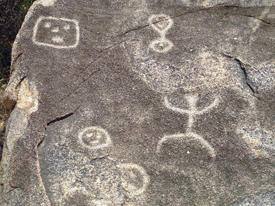 The petroglyphs are spread over a 10 acres area that are marked or carved on large stones or boulders. Each stone or boulder depending on the size has been named an "element", and each one has unusual markings, that scientists believe hold some information about the natives. Element 1 is the rock closest to the top, in one of the main archaeological sites, that can be found under a big outcropping that helps protect it from the weather and other adversities. The anthropomorphic engravings, bearing some resemblance to men, zoomorphic, or animal shapes or forms, and the phytomorphic, plant shapes, are a study in themselves. They believed in an ancient creation myth, that held 3 faces, one towards the sky, or whatever was up there, one looks west and the other south. Towards the west, or by the face that looks west, there are five smaller faces of various sizes and shapes, and in the south, or the face that is looking or facing that way, there is a schematic engraving that shows two people, what look to be a man and a woman, with arms raised and fingers open, or spread. There is a stream that passes nearby, when the rainy season is there, but otherwise is dry. Element 2 is separated into three parts, with a group of people taking part in a ceremony, with a man or figure praying and dancing for attention and help from the gods. Some of the figures have different lines that might be for relationship to ancestors or each other. It is one of those fantastic sites that has been opened to the public, with facilities, since it has become so popular, and it is unique in that no one really knows for sure what the engravings mean, it can only be supposition since we don't have any people or relics that could help differentiate what means what. It is all based on conjecture, guessing based on what knowledge has been gained from other native tribes like the Aztecs or Mayans. A great place to visit while in Acapulco, and one that will probably haunt your mind for ages. The La Quebrada Cliff divers are an organization of professional high divers, that jump from cliffs in Acapulco, Mexico; performing shows every day in the afternoons and nights, diving almost 150 feet into the ocean below. In the darkness of night, they use torches while diving into the sea, and was shown regularly on the weekends in this country in the 1960s and 1970s. 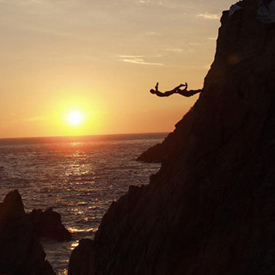 These brave and talented divers have been doing this for decades, although it wasn't until 1934 that the La Quebrada Cliff Divers organization was created. This is where the World Cliff Diving Championships are held. La Quebrada is Spanish or gulch or ravine, and it is a long way down. The divers have to wait until just the right time to dive, otherwise they would plummet to their death in the shallow waters. A restaurant has been built in the side of the cliffs so that people can enjoy drinks or food while they watch these masters of disasters dive into the sea, with nerves of steel coursing through their veins. The majority of these divers have grown up from the families of divers that have been doing this for many years. Just imagine diving into the blackness of night, from a high cliff, hoping that you have timed the tide and incoming wave perfectly so that when you land in the water, there is plenty of room to cushion you before you collide with the various rocks that form the coastline below. Now is the best time to take advantage of the newest online program from Alamo Rental Cars. With our printable coupons, you will be able to save even more money than with our regular coupon program. Alamo's newest coupon program will give you the BEST deals.